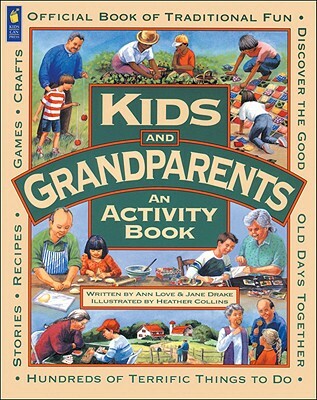 Whether they live on the same block or on opposite sides of the world, kids and grandparents can make memories and bridge the generation gap with this fun-filled activity book in the Family Fun series created just for them Children will enjoy learning the games their grandparents played (remember cat's cradle? ), and grandparents will get a kick out of the gifts they receive from their grandkids. Together they can research the family tree, make a birdfeeder, plant a garden or create their own memory book. Regardless of which activity they choose, they will treasure the time they spend together. Description: Whether they live on the same block or on opposite sides of the world, kids and grandparents can make memories and bridge the generation gap with this fun-filled activity book created just for them! Children will enjoy learning the games their grandparents played (remember cat's cradle? ), and grandparents will get a kick out of the gifts they receive from their grandkids. Together they can research the family tree, make a birdfeeder, plant a garden or create their own memory book. Regardless of which activity they choose, they will treasure the time they spend together. 2001 Gold Star Award by the Neighbourhood Toy Stores of Canada Association (in the “Weekends with Grandparents, Under $15” category) Award given to toys that show superior play value and durability.